For Casey Carcaba, growing up in his family’s business, Carcaba Electric, lunch at The Cheese Wheel and Sandwich Board, the neighborhood sandwich shop, was a highlight of the day. Now, Casey owns it! Casey learned how to run the family electric company from his father and grandfather. He learned the restaurant trade from local icons at O.C. White’s, Saltwater Cowboys, Fiddler’s Green and Creekside Dinery. Casey saw firsthand what it takes to run a successful business and how to diversify his talents. In 2014, he was busy running the family electric company when he heard The Cheese Wheel was closing. After 30 years of serving delicious sandwiches, longtime owner Antje Hesson was retiring, and Casey offered to buy it. Now located at 223 W. King Street, The Cheese Wheel serves delicious breakfasts and lunch. 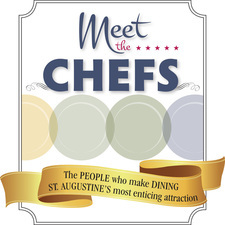 This year they won Taste of St. Augustine’s “Best Family Restaurant,” with their hot pressed classic Cuban piled high with thinly shaved pork loin, ham and Swiss cheese with Datil mustard and pickles. Other favorites include the Turkey Ryder and new hot items: the Rachel, a grilled Reuben with turkey, Chicken Parmigiana and Philly Cheese Steak. 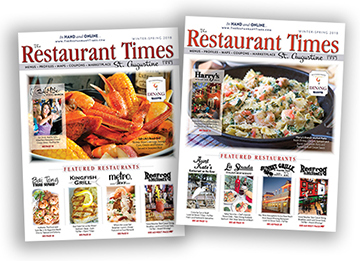 With plans for expanding the menu, kitchen manager Jessica Burrill joined the team and is adding homemade biscuits and cinnamon rolls as well as house-prepared meats, cold cuts and other deli items for dining in or take out. Casey and Jess can also cater your social or business functions. The Cheese Wheel, a St. Augustine sandwich tradition, just keeps getting better!